In October 1991, more than 600 persons from virtually every state in the United States, Canada, Puerto Rico, Central America, and the Marshall Islands gathered in Washington D.C. at the First National People of Color Environmental Leadership Summit. 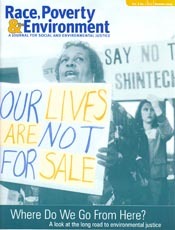 It was a defining moment for the environmental justice movement in the United States. One of the Summit's most important contributions was the adoption of the Principles of Environmental Justice. The global degradation of the environment threatens the survival of all life on this planet as well as human life. While this degradation affects all people, it does so unequally. This is a central point regarding the connection between Puerto Ricans and Latinos and the environment in the USA. How is this possible? To start, the degradation of the environment is generally the result of human activity; in particular, how society creates and recreates its life. In other words... the unequal degradation of the environment results from the unity of production and the social order. Production can be understood as industrial activity, and the social order is the way in which the society is organized around recreating its life, enabling production to happen. During the past few years discussion of "environmental justice" or "environmental racism" has expanded from the realm of a few grassroots organizations to become one of the trendiest issues of the day. Nearly everyone seems to be jumping into the fray—including the "big ten" environmental organizations, the EPA, Congress, corporate America, and on up to President Clinton. Likewise, within the legal community, the issue has moved from the discussions and litigation of a handful of activist attorneys to become the subject of numerous conferences, seminars, law school symposia, and so on. Read more about "What's Intent Got To Do With It?" Read more about Why the Law? As we continue to wreak destruction upon the Earth and upon each other, we are reaching a point where our actions are having dire consequences. We have embarked upon a market system that not only ravishes the Earth, but it diminishes the value of the lives of Earth's people. It is an out of control market system - a market system that extends into and shapes our personal lives, our consciousness, and the way in which we relate to one another. In our most intimate relations we often perceive one another as having instrumental value. That is, we view our friends in terms of what they can do for us-not what we can do for them or what both parties gain from the friendship. 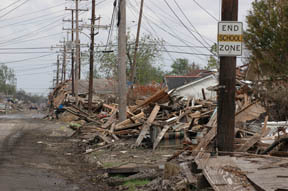 B. Jesse Clarke: New Orleans stands as an all-too-powerful example of what the future may hold if we fail to advance progressive alternatives to the ongoing planned disaster of current models of economic development. In looking at global economic situations, it is clear that we need to promote green economic development as a significant part of the solution, both for climate change and rebuilding, in the wake of disasters. But how can this solution be integrated with historic equity challenges faced by low-income people in communities of color in the distribution of public and private resources? This issue of Race, Poverty and the Environment both celebrates the EJ Movement and offers a critique of it. At this critical point in EJ history, RPE takes a big-picture look at the Movement's past, present and future. In the "Looking Back" section, three articles explore the relationship between EJ and the Civil Rights Movement, examining lessons learned from liberation struggles of the 60s and 70s, as well as failures and missteps to avoid. With this hindsight and analysis, the EJ Movement has the potential to be even more powerful and effective than the social change struggles that preceded it. Another article delves into the tensions between EJ and the environmental movement. The section ends with a review of key milestones in the Movement's history.